Kathy Bransfield's simple-yet-sophisticated design is a wearable reminder to live in the moment. When opportunity knocks or matters of the heart arise, there's no time like the present. Kathy Bransfield's simple-yet-sophisticated design is a wearable reminder to live in the moment. The rolling barrel of sterling silver bears this inspiration to embrace every opportunity. 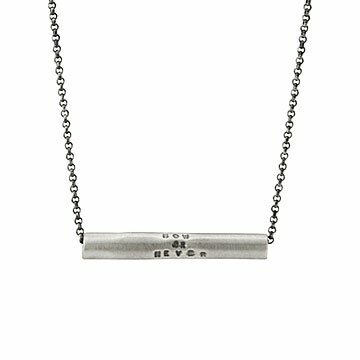 Suspended from an 18-inch antiqued silver chain, the design makes a mindful addition to your ensemble or thoughtful gift for poetic procrastinators. Handmade in California.